Awards season is in full-swing, with the 23rd Screen Actors Guild Awards bringing together Hollywood's most talented faces. While many of our favorite celebrities talked politics at this year's SAGs, we can't help discussing what these stars brought to the red carpet. And with that, hair was the talk of the night! Some of our favorite red carpet trends included bows, textured bobs and messy waves. 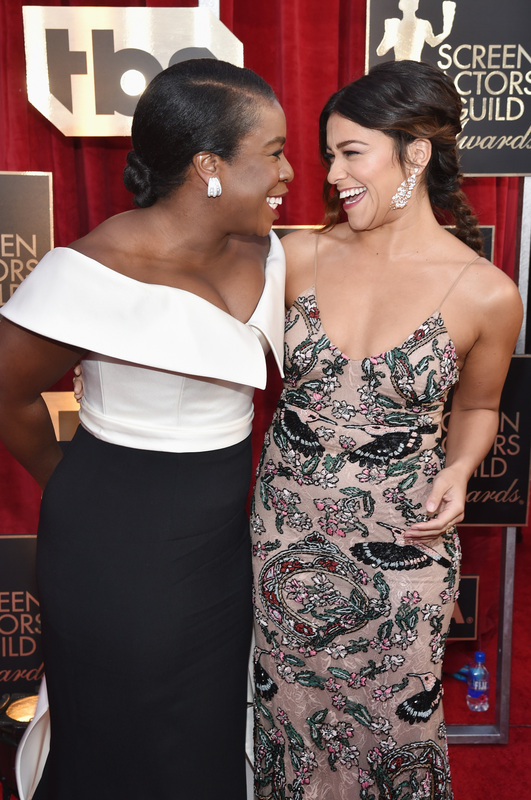 Everyone was talking about Gina Rodriguez's gorgeous locks. In a volumized messy braid, Rodriguez managed to make Hollywood glamour look effortless. Other favorites included Emma Stone, who went old Hollywood with aside-swept bob and Viola Davis who shows us how to texture and angle hair the right way. Emily Blunt stunned with a simple and sleek look. Celebrity hairstylist Ashley Streicher, created a modern and young look for Emily Blunt at this evening’s 2017 SAG Awards, with the help of essentials from Goldwell and VARIS. Streicher shares below how to get Emily Blunt’s hair look from tonight’s red carpet. 1. Streicher started with Goldwell’s Kerasilk Reconstruct Regenerating Blow-Dry Spray by brushing through hair from roots to the ends. She then sprayed Goldwell Kerasilk Repower Volume Blow-Dry Spray through the roots of Blunt's wet hair. 2. Then, Streicher gave Blunt a strong side part and began to blow dry her hair straight with the VARIS Creative Energy Blow Dryer, with the concentrator nozzle to get the hair smooth. She blew each section using the VARIS Boar Brush in Large finishing each section with hairspray. 3. After Blunt's hair was completely dry, Streicher sprayed her hands with Goldwell’s Kerasilk Control Rich Protective Oil and smoothed through the ends of hair. 4. Next, Streicher used VARIS Creative Energy Smoother on high heat to gently go over each section of Blunt's hair making the ends slightly more straight and smooth. She then brushed and hair sprayed the hair behind Blunt's ears and held in place to set with setting clips. 5. Lastly, right before Blunt left for the red carpet, Streicher unclipped Her hair and brushed through slightly, while adding hairspray to catch any flyaways. Claire Foy’s hairstylist, Jillian Halouska, went for a sleek chignon using Matrix Style Link products for the actress’ SAG Awards looks. "Claire's Valentino dress was very lovely and intricate. I wanted to edge it up a little and give the hair an editorial, runway feel. She's always down to try new styles and I had been planning with her makeup artist and stylist for about a week. The final look was an effortless, young and chic chignon," Jillian said. 1. On damp hair, apply Matrix Style Link Blowout Skinny Queen ($20, Matrix.com), create a center part and blow dry. 2. Part out front pieces on each side before the ear. Using the blow dryer and a round brush, twist each piece back. 3. Using Matrix Style Link Over Achiever ($18, Matrix.com), muss up the rest of the hair to create texture and dimension. Pull into a low pony tail leaving the front two pieces out. 4. Separate pony into three pieces and coil them around each other. Sculpt the pieces into a chignon to your liking, pinning as you go. 5. Half-tuck the front behind the ears and loosely pin a few pieces into the chignon. Lightly mist Matrix Biolage R.A.W. Replenish Oil-Mist ($24, Matrix.com) all over for a nice, healthy sheen. 6. Lock everything in with Matrix Style Link Style Fixer ($18, Matrix.com).